Brewery: Golden Valley Brewery & Pub website. How served: 12oz capped bomber poured into a Stone IPA glass. I paired this beer with: Snyder’s sourdough hard pretzels. Note: This beer poured a deep amber with a finger and a half tan head which thinned quickly leaving almost no lacing in the glass. The nose was sweet with malt and caramel and a hint of spicy hops. The taste was sweet with caramel and malt notes and finished with some hop bitterness. The mouthfeel was of a medium body with some sharpness in the feel at the end The drinkability was good as it had a mildly pleasant alcohol warmth which makes this a very good winter warmer. This beer really improved as it warmed up in the glass. 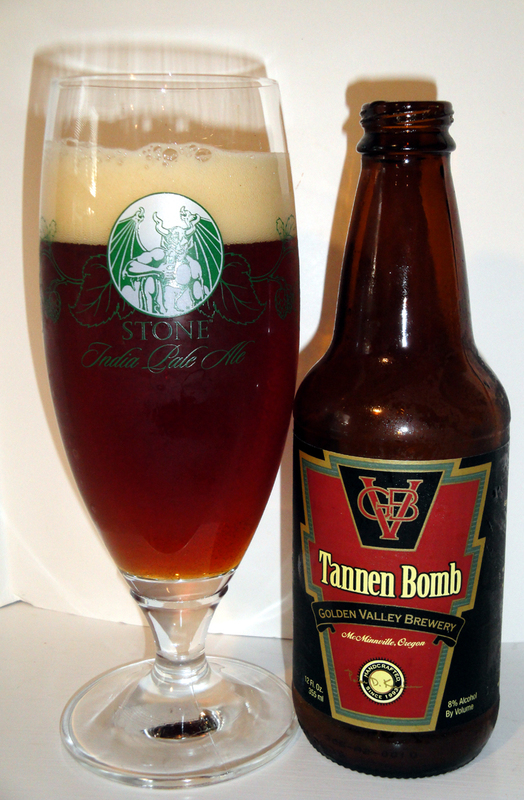 On the Label: Golden Valley’s Tannen Bomb is our bold ale with a massive malt complex. Brewed especially to take the chill off the cold winter months. From their website: Massie complex beer brewed especially to bring warmth and cheer to the cold wet winter months of the great Northwest. Our famous award-winning traditional style bold winter warmer, rated #3 “Winter Warmer” nationally. TANNENBOMB O.G. 1.090, I.B.U. 40, A.B.V. 8.8, 125 pounds of malt per barrel! Available Oct to January.